Обраќање на Доц. д-р Синиша Наумоски, Извршен Директор на АБИТ, пред Генаралното сонрание на EBTN - Annual General Meeting of Members & Membership Meeting (Helsinki, 27 June 2014) — in Helsinki, Finland. Allow me to thank you for the opportunity to participate and address you on today’s Annual General Meeting of the European Banking and Financial Services Training Association. 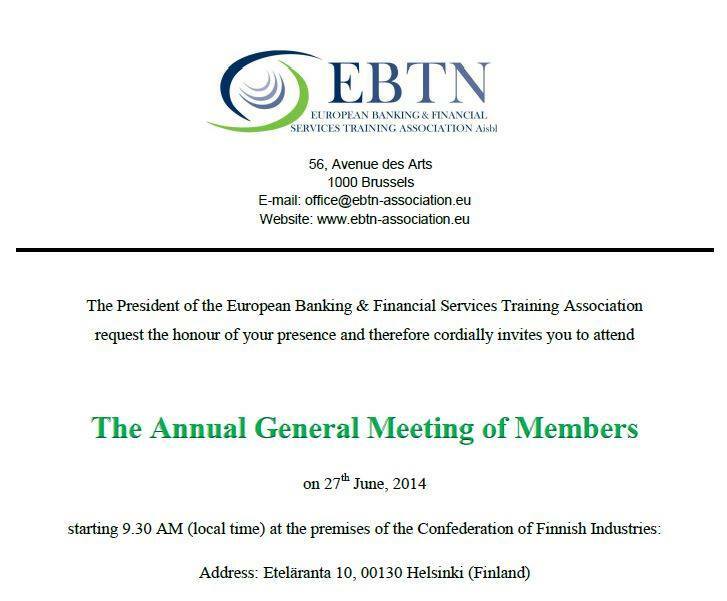 I honestly hope that today you will give your support to the Academy for Banking and Information Technology, for it to become an Associate Member of EBTN (European Banking and Financial Services Training Association). This will be a great honor for us, as well as a great responsibility to represent and honor the goals of EBTN. I, also, want to publicly thank the members of the Board of Directors of EBTN, who unanimously gave a positive recommendation for the Academy for Banking and Information Technology as an Associate Member. Leading experts from the Central Bank from my country, more than 10 CEO’s from Commercial Banks, as well as myself personally, as an Assistant Professor of Finance and Accounting, set a goal: for ABIT to organize financial education and help raise the level of financial literacy among the population of my country, as well as the organization of training and seminars for financial workers according to EU standards. Honored guests, in our country there is a rift between the banking sector and potential new entrepreneurs. This rift is growing wider with time. Therefore, ABIT will offer practical advice and expert help during crediting and creation of business plans for applying in Banks for young entrepreneurs. 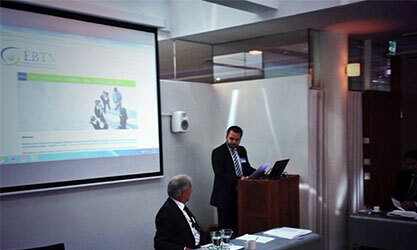 ABIT has integrated many banking experts and members of UO for this purpose (more than 20 bank managers). In ABIT we say that the “banking industry” is a good friend to companies and to the people, and not an enemy due to high profit. I would say: only countries and individuals that have perfect relations with banks are rich, therefore making banks richer. This is a GOOD thing! Banks return money into the business sector. Banks are our best friends both on micro and macro plans. No other way! My government knows this, and respects it. I strongly believe that moving the banking affiliation closer to the business sector through training and certified specialist seminars according to EBTN standard will lead to great SUCCESS in my country. Associate Professor Arsovski Dragoljub, who is also a member of our Academic Council, stated in his research paper: The Bank is a distinct kind of agency, most often organized as a shareholders company that deals with a specific product – money. Is money the fundamental activity of commercial banks? Contemporary banking in a market of harsh (perfect) competition has the basic goal to enable long-term security for its clients, as opposed to the “old-fashioned” goal of maximizing the profit. Finally, I want to tell you more about the ABIT’s mission, vision, and future goals.